Herbert W. Bateman IV, Interpreting the General Letters, Handbook for New Testament Exegesis, ed. John D. Harvey (Grand Rapids: Kregel, 2013). Interpreting the General Letters is the third of four volumes intended to introduce and demonstrate a methodology for interpreting and communicating the books of the New Testament. The volume at hand covers Hebrews through Jude. The book consists of seven chapters. The first three relate more to background issues, namely, the genre, background, and theology of the General Letters. The next three chapters present a nine-step process moving from translation, text-criticism, exegesis, to homiletics. The final chapter uses two passages (Jude 5–7; Hebrews 10.19–25) to demonstrate the nine step process. This volume includes a nice bibliography and brief glossary. While Interpreting the General Letters provides significant help and insight in the process of moving from exegesis to exposition, there are a few minor critiques that can be made. First, I am not sure that all the material included is truly necessary. A case in point is Bateman’s brief history of the English Bible (pp. 135–39). While the discussion is interesting, it is doubtful that it is essential for the task at hand. Second, the importance of some material is not really demonstrated well. For example, after an extended discussion of Greco-Roman letters (pp. 19–54) a few comments, mostly speculative, are made related to how understanding this material contributes to a specific understanding of the General Letters (pp. 54–56). It would be nice to see specific ways in which this background material impacts the interpretation of specific texts. It is also puzzling that so much is made about Greco-Roman letter forms and little is noted about ancient homiletical practices. This absence is significant since many interpreters today believe that Hebrews and perhaps James are more homily than letter. Third, while one hesitates to mention typos (since all works have them), they are somewhat conspicuous in this work (see pp. 77, 78, 88, 91, 102, 105, 109, 111, 114, 118, 119, 121, 122, 123, 124, 125, 292, 295, 298, 304). Finally, many will not be convinced that Bateman has the provenance correct in seeing Jude’s antagonists as Jewish rebels rather than the more traditional identification of false teachers (pp. 84–87). This idiosyncratic thesis would need to discuss the striking similarities between Jude and 2 Peter, another letter often held to address false teachers. Unfortunately, Bateman does not do this. 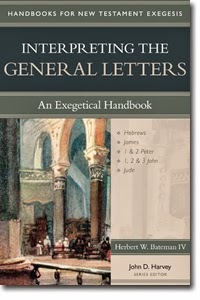 At bottom, Interpreting the General Letters is a solid resource for anyone interested in interpretation generally, and in the General Letters specifically. A reader will need some working knowledge of Greek to get the most benefit from this book but those lacking such facility could still benefit from much of the content. Bateman has done his homework and summarized and packaged much helpful information for students of the Bible. You can access an excerpt here. Thanks to Kregel for providing the free book used in this unbiased review.